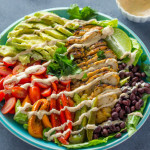 Healthy and flavorful cilantro lime chicken salad, topped with a delicious homemade skinny chipotle ranch dressing is the perfect filling lunch. One of the things I always prefer to make at home is salads. Why pay over $15 for a salad you can make at home 1000x better at a fraction of the price?! plus, homemade is so much fresher and tastier. 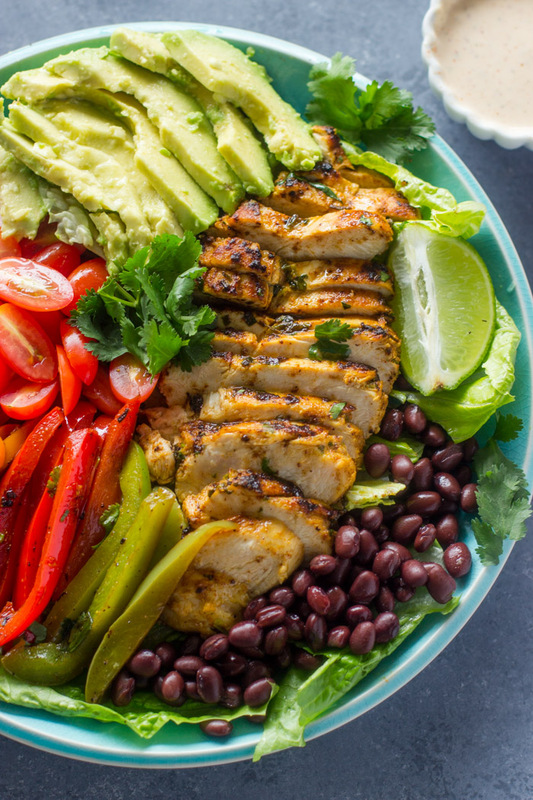 When I have salad it must have protein and something zesty. 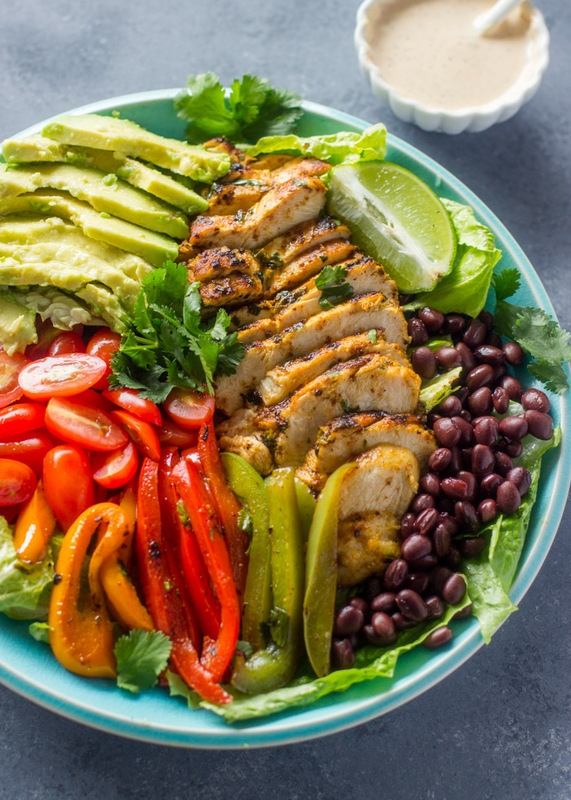 The Cilantro lime chicken along with the avocados and bell peppers are perfect! 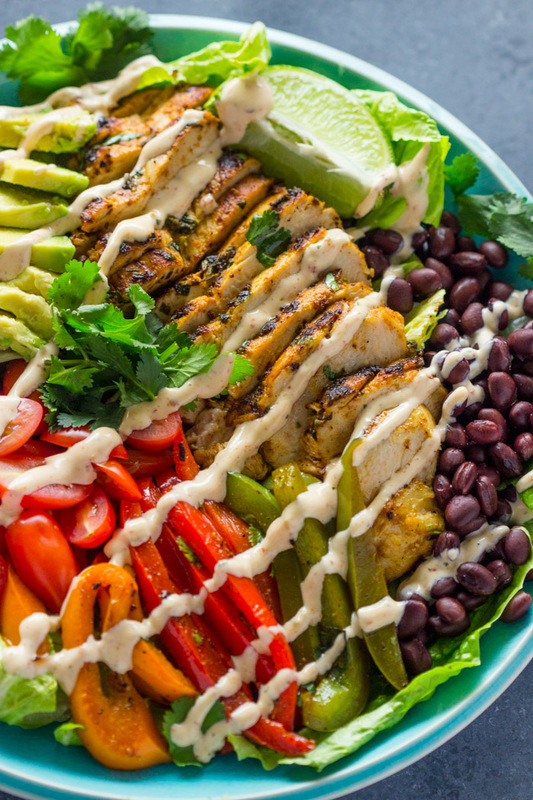 plus, the skinny chipotle ranch dressing is the cherry on top. It’s zesty, creamy, and spicy. 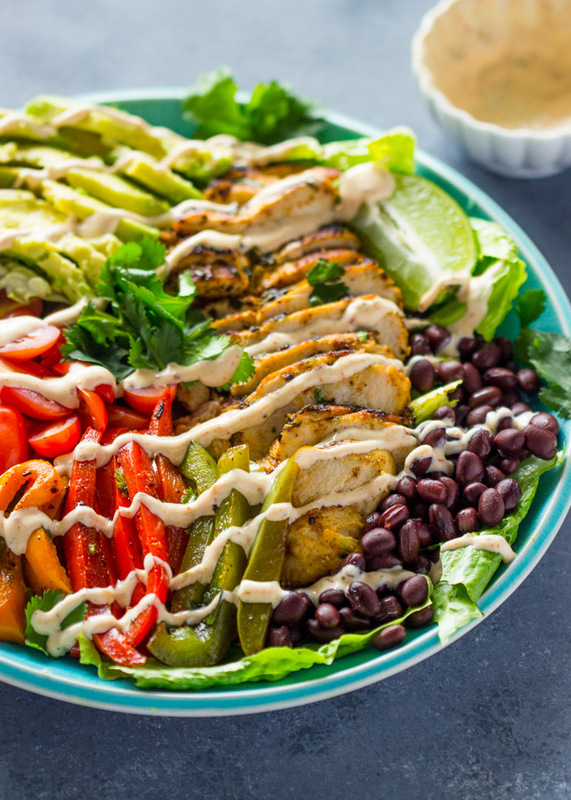 If you’ve never had chipotle dressing this is the time to start! To make the dressing you simply combine greek yogurt, 1 tablespoon light mayo, lime juice and herbs in the food processor. It serves 4 people and is only 48 calories per serving! 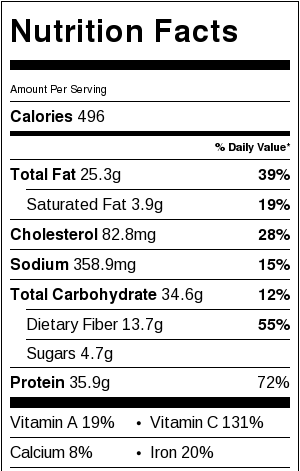 and that’s assuming you use so much like I do, but if you just drizzle it, then it’s even fewer calories. Mix the olive oil, lime juice, cilantro, salt, cumin, and paprika in a large bowl or ziplock bag. Add the chicken and mix with your hands (or shake bag, if using ziplock) until the chicken is fully covered. Cover and place in the fridge for 20 minutes to marinate or up to 2 days in advanced. Heat a heavy-duty skillet to medium/high heat. Add 1 tablespoon olive oil and the chicken breasts. Cook for 6-7 minutes on each side. Remove from pan and add the bell peppers to the pan (do not wash pan) cook bell peppers for 2-3 minutes or until tender. To Assemble: Slice chicken into thin strips. Prepare two salad plates. Place half of the romaine lettuce on each plate. Top with 1 chicken breast on each plate. 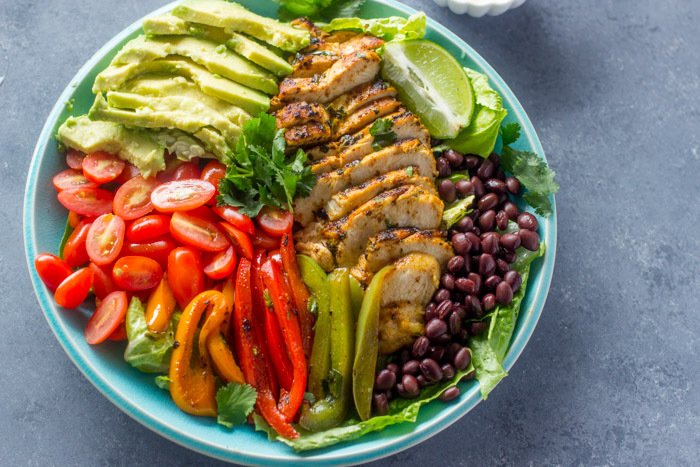 Divide the tomatoes, beans, bell peppers, and half of each avocado onto each plate. 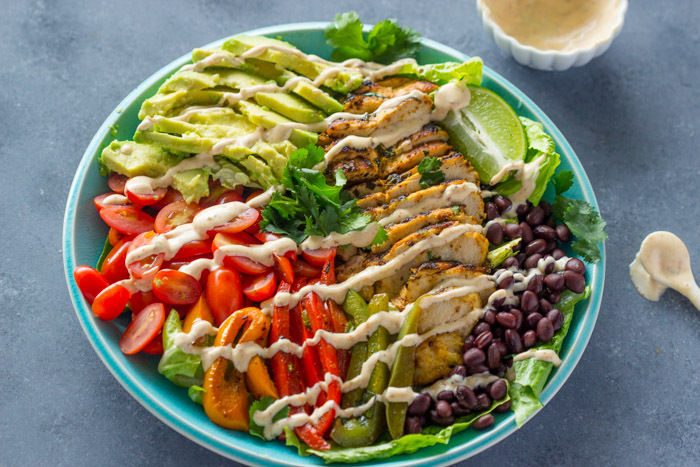 Drizzle with skinny chipotle ranch dressing. To Make Dressing: Add all ingredients to a food processor and pulse until chipotle peppers and cilantro are well minced. Store up to 4 weeks in the fridge.